Until an year back, I was minimalistic at heart, and enjoyed keeping the look clean accompanied with plain textures ! A sight of plains, neutrals and stripes dominated my closet then. Today all I wanna do is just add essential trends and freshen up my basics rather than go on shopping endlessly. I don't think I would have tried mixing prints a few years ago, but am finally glad, that I decided to walk this route.As of now, lets call it a mixed-print baby step . If mixing prints feels too overwhelming, try layering a long-sleeve striped top under something solid. Take the look to a next level by adding a printed accessory (leopard shoes, scarf, camo pants, etc.). By the time you read this post I would be taking time off from the blog for a while and spend these holidays with my family and in self enrichment ! Delhi is going to be frigid in few days(as per weather reports) And I am gonna shake off these winter chills, by going to someplace warm !! It might be difficult to update on the blog, but I would be live and very active on my Insta feed ! Skirt is great! I think other prints it's too much for me :) Merry christmas! you pulled it out very nicely! Merry Christmas.... n njoy ur holidays....! great outfit. I love mixing florals with stripes so this outfit certainly jumped out at me. loving the red tights too. OMG I love the skirt !!! Stunning !! Love what you've done with this outfit! You look great! love your outfit and happy holidays!! 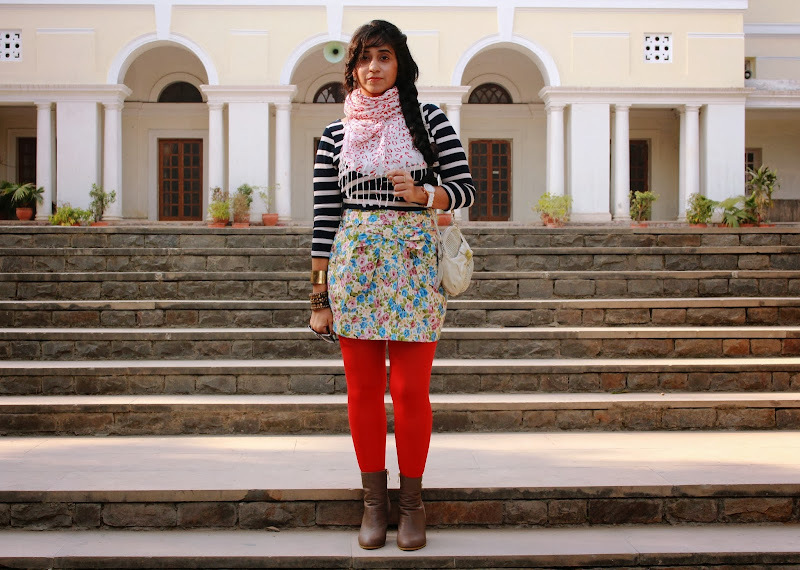 Daring use of prints on prints! Love it. Love it! That skirt is adorable!! Wauw, beautiful pictures! Shall we follow each other on bloglovin? I follow you now :) Follow you back? Love how the bright red breaks the clash of the contrast stripes & florals!!! Enjoy your holiday! Have a great New Year! 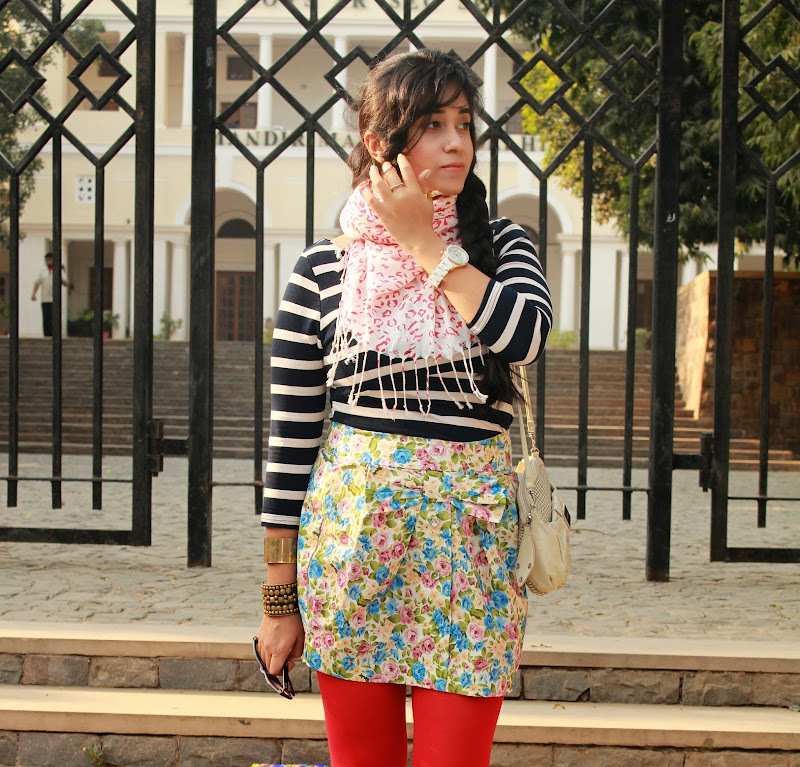 Hey..u look so beautiful..u just took the mixing prints trend a notch higher. Hope u r enjoying ur vacation. you have to be a very fashionable person to pull this off because it does not work for everyone. However, you bombed this look! Love it. Looks very fun, carefree, but chic. Wooow, Dear, i've come to your blog just by accident after sorting some of blogs. And I'm very happy of that fact I came here, bcs your style is really nice and very sophisticated. Would You like to follow each other ? Just let me know on my blog or via Facebook. Super love your skirt, my dear! followed.. waiting for you to follow via twitter, youtube, insta and gfc!! Hi Surbhi! Wishing you and your sweet family a healthy, happy and prosperous 2014. May ALL your dreams come true. the skirt is so adorable!!! Hi you look so prettily I follow you now and Hope you do the same! Happy new y era, darling!